This Is What Abraham Lincoln Would Have Seen. "He said he wanted to visit the Holy Land and see those places hallowed by the footprints of the Saviour. 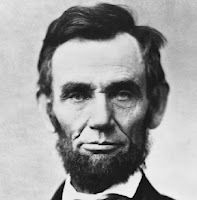 He was saying there was no city he so much desired to see as Jerusalem," Mary Todd Lincoln told the Springfield, Ill. pastor who presided at Abraham Lincoln's funeral. She explained that the 16th president told her of his desire moments before he was fatally shot in Ford's Theater on April 14, 1865. Recently digitalized photos from the Library of Congress show in exceptional detail the Western Wall of the Temple Mount Lincoln would have seen in 1865. The photographs, released by the Library at our request, will appear with analyses in this spot and in the Jerusalem Post later this week. We thank the photo archive staff at the Library of Congress for their assistance. Meanwhile, we present here two small sections of the photographs to show why we are so excited about the minute detail of the photos taken 150 years ago. Even the memorial graffiti on the Western Wall, a practice common even into the early 20th century, can be read. * Lincoln's Secretary of State William H. Seward visited Jerusalem in 1859, and Lincoln may have heard accounts from him. Seward returned to Palestine in 1871. Read Seward's fascinating account of his visit, his breakdown of Jerusalem's residents by religion, his visit to the "Wailing Place of the Jews," and his joining Friday night services at the Hurva Synagogue. This is awesome, thanks for sharing. I cannot wait to see the article when it comes out! I live a few miles south of Springfield, IL.